Continuing his dominance of the flat stages of this year’s race, Andrea Guardini made history today when he became the first rider to clock up ten stage victories in the event. 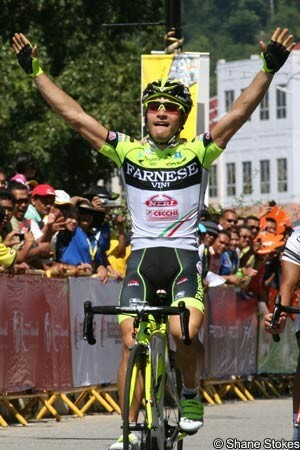 The Farnese Vini – Selle Italia sprinter was first to the finish at the end of a rain-lashed stage to Kuala Terengganu, beating Matteo Pelucchi (Team Europcar), Raymond Kreder (Garmin Barracuda), Jacobe Keough (UnitedHealthcare) and others in the front group. The victory was his fifth of this year’s race, adding to the five he clocked up in last year’s event. “The Tour de Langkawi is very special to me as it was here where I took the first wins in my professional career,” he said at the finish. “Because of that, it is great to get the record of ten stage wins. I thank my team for the perfect lead out for the stage today." Guardini’s triumph saw him retake the blue jersey of points leader from Astana’s Valentin Iglinskiy. The Kazahstan rider had scooped the lead in that competition two days ago, but was only able to finish sixth today. Guardini had also pipped him in the first of the day’s intermediate sprints, and while the two both ended the day with 79 points, the Italian’s better stage placings saw him retake that jersey. After a long-distance break continuing Garmin Barracuda’s Nathan Haas, David McCann (RTS Racing Team), former race winner Anthony Charteau (Europcar) and Reinardt Janse Van Rensburg (MTN Qhubeka) was hauled back minutes from the end, a big pileup split the bunch and delayed many riders. Amongst those held up was the overall leader Jose Serpa (Androni Giocattoli – Selle Italia), but as the incident happened inside the final three kilometres, they were all given the same time. He consequently maintains his thirty second advantage over his team-mate Jose Rujano, another former winner of the race. Victor Nino Corridor (Azad University) stays third, while Alexandr Dyachenko (Astana) remains fourth. He got clear during the stage but the danger was recognized and the move was quickly closed down. According to his team manager Gianni Savio, the likely victory is down to the sixth stage of the race. In fact, each of his overall triumphs have rotated around a big performance there by his riders. The squad is also in line to take the team general classification. This too was a stated goal before the start of the race and the squad has dominated it thus far. It is a full twelve minutes and six seconds clear of Astana. Serpa is also the pending winner of the King of the Mountains classification. Another overcast day awaited the riders at the start of the penultimate stage of the Tour de Langkawi, with those clouds turning to heavy rain very soon after the start in Kemasik. Multiple attacks were fired off before the first intermediate sprint in Dungun, 38.9 kilometres after the start, but nothing remained clear for long. The bunch contested that first sprint together and there Harrif Salleh was first, ahead of Jacobe Keough (UnitedHealthcare). The two riders battling for the points competition, Andrea Guardini (Farnese Vini Selle Italia) and Valentin Iglinskiy (Astana), placed third and fourth there, with the Italian inching closer to taking back the blue jersey. Repeated attacks followed, with Paolo Locatelli Colnago) and Louis Crosby (New Zealand) getting clear and being joined by Alexandr Dyachenko (Astana) and Thomas Bertolini (Farnese Vini – Selle Italia). However Dyachenko started the day fourth overall and the move was predictably chased down. Another quartet tried at kilometre 88 and had more success. Garmin Barracuda’s Nathan Haas, David McCann (RTS Racing Team), former race winner Anthony Charteau (Europcar) and Reinardt Janse Van Rensburg (MTN Qhubeka) quickly gained time and built a lead of over two and a half minutes. McCann was first in the sprint at Kg Pela (km 99.6), crossing the prime line ahead of Van Rensburg, Charteau and Haas, after which the breakaway continued and had clocked up an average speed of 51 kilometres per hour in two hours of racing. The Irishman was again first to the line at Kuala Berang (km 118.7), with Charteau, Van Rensburg and Haas second third, and fourth. The finish was just over 45 kilometres away at that point and this prompted the peloton – specifically, the Drapac Cycling team – to chase. With 40 kilometres left, the gap was down to one minute 29 seconds, and this fell by 22 seconds over the next ten kilometres. The gap continued to fall and was just twelve seconds with seven kilometres remaining. Haas tried to jump clear after that point but everything came back together. A massive bunch sprint looked possible, but a big crash inside the final three kilometres meant that a much smaller group sprinted it out for the victory. Raymond Kreder (Garmin Barracuda) preempted Guardini’s jump, hitting out early, but the Italian was too strong and came through to take win number five at this year’s race, and ten in all. He will have another chance tomorrow when the riders tackle the final stage, a 114.8 kilometre race from Tasik Kenyir to Kuala Terenggannu.